This helpful introduction to yoga keeps it simple. 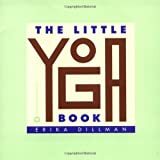 Erika Dillman explains some of the ideas about mind-body connections and the benefits of regular yoga practice, then explains how to prepare for yoga, and finally devotes the major section of the book to yoga exercises and poses. The text is clear and the diagrams are fairly helpful. Dillman emphasizes that it would be best to get the help of a trained yoga teacher before starting to do any yoga exercise, and that seems like good advice. If you were to use a book to do yoga for the first time, Id recommend using a book with larger format photographs to really make it obvious what positions you are aiming for  the small diagrams here will not be of great help. So this book will be most useful for people who already have done some yoga but need a reminder of some of the basics.